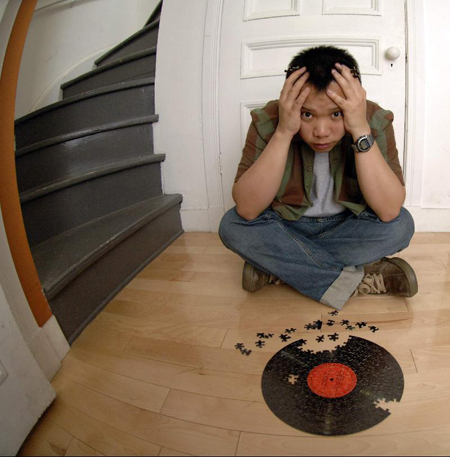 A couple years back, Eric (aka Kid Koala) and Dylan J. Frombach (aka Dynomite D) were approached to create a psych rock-influence score for a documentary. Problem was that after the work was done, the film folded and was never released. Years later, Koala & Dylan met the former rhythm section of Wolfmother and began telling them all about the film and its lost music. Chris Ross and Myles Heskett loved the clips and urged that the material had to be heard; subsequently Kid Koala and the guys decided to put a show on the road. Now, we have a chance to hear this collaboration. This one-off tour features drums, bass/keys and the DJs working across six turntables with sampled guitar cuts and heavy beats. I’ve always been impressed with Koala’s live show, so this might just be the ticket in sept/oct. Check it out. « Frightened Rabbit at The Horseshoe Tavern (July 22nd)	» This Blackest Purse by Why?